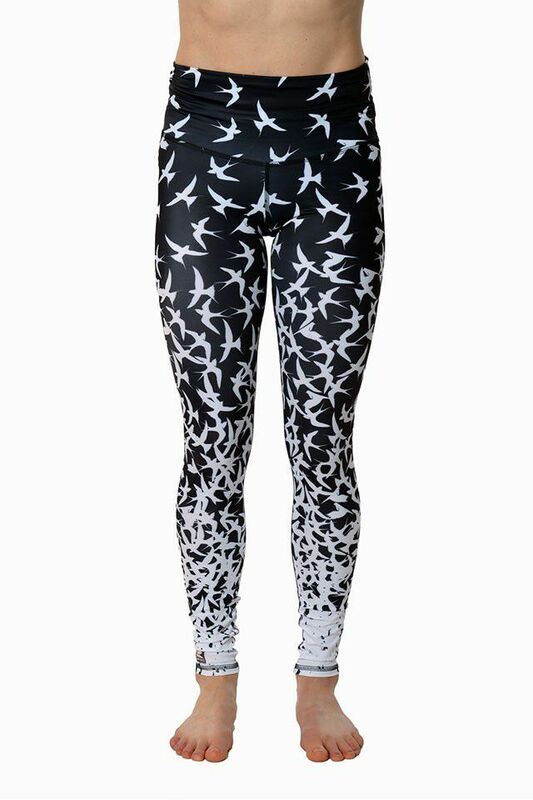 Beautifully patterned tights in recycled polyesterlycra. The material is very stretchy and has a composition of 78% recycled polyester, 22% elastane. The pants have a high waist that can be folded down. The leggings has a star shaped crutch for extra comfort and all seams are sewn with flat flatlock stitch. These yogatights are long in the legs so even if you are tall and slim you can have them in full length, and if you are shortlegged you'll have a nice wrinkle at the bottom of your ankle. The fabric is printed in Denmark with a birdprint designed by us. . We love our new bird pattern! They are available in both black/white and chakra colored.